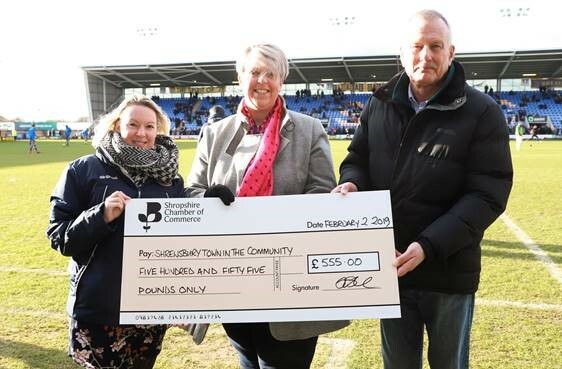 Shropshire Chamber of Commerce has presented a £555 cheque to Shrewsbury Town in the Community after raising money for the charity with a quiz night. Members of Shropshire Chamber, raised the money donated through ticket sales and a raffle draw which included prizes from Hatfield’s Jaguar, The Shrewsbury Club, Nick Jones Wealth Planning and Shrewsbury Town Football Club. Teresa Rowe, Shropshire Chamber Events Manager, said “This is a brand new event in the Chamber events calendar and proved to be really successful, it was great to see so many business men and women laughing and having fun with one another in a social environment and at the same time raising funds for such a local worthy cause. We are already planning the next quiz following feedback from those who came. Richard Sheehan, Chief Executive of Shropshire Chamber said “As a Chamber of Commerce we are privileged to sit at the heart of our business community, we recognise we have a part to play in supporting the work of our magnificent charity sector and do this through our Patron members and our adopted charity scheme. Raising funds is an ever-increasing challenge so I was delighted to hear that we had taxed our members brains and their wallets on behalf of this worthy cause. 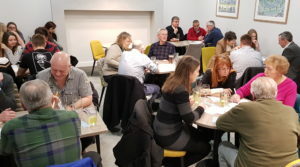 The event was held in January at the Shrewsbury Club, Shrewsbury with Graham Mills, Entrepreneur Club Development Consultant taking the role of quiz master for the evening. Fifteen teams of 4 players took part on the evening with the team from Henshalls Insurance being crowned the winners after a tightly fought competition. There was plenty of rivalry present throughout the evening but all in good spirit and all for a well-deserved charity. Shropshire Chamber of Commerce would like to thank all the members who took part and made this event truly successful. Teresa Rowe along with Graham Mills, presented the cheque to Ceri Nicholls, Partnership and Events Manager at Shrewsbury Town in the Community on Saturday 2nd Feb before the league match between Shrewsbury Town and Luton. Shrewsbury Town in the Community is the official charity of Shrewsbury Town Football Club.